"Well, of course we talk....Don't everybody?" How many films can you think of that are worthy of the term 'perfection'? Able to balance all the primary elements of movie making and not come up shortchanged in any area? Singin' in the Rain is one of those few cinematic masterpieces to have achieved such a feat: Acting, direction, scoring, editing, dancing, etc... It excels on all counts and still holds up beautifully 46 years later. One of the sweetest childhood memories I still hold dear was seeing the unforgettable production number showcasing the film's title song on the big screen as part of the wonderful 1974 anthology film, That's Entertainment! (sorely needed on DVD, by the way). Witnessing Gene Kelly for the first time soaked under the elements yet dancing and singing like it was the sunniest day mankind had ever known (at least until that stone-faced policeman came along), was beyond mesmerizing. Every time I've seen Singin' since, this sequence never fails to give me that same warm afterglow. Yet, there's more magic where that came from as the film amusingly chronicles that critical period in Hollywood history as the movie industry made the transition from silents to talkies. Don Lockwood (Kelly) and Lina Lamont (Jean Hagen) are Hollywood's dream couple on the silver screen, but a nightmare of a twosome off the set: She being a bubble-headed ditz who believes her own publicity; he being an slightly egotistical screen idol forced to play along with Lina's shenanigans for the sake of both their careers. Nevertheless, all is well for the silent-era sweeties until the success of The Jazz Singer turns the movie industry upside down, forcing their film studio to adapt to the impending changes. One problem: Lina's voice makes nails scratching a blackboard sound pleasant by comparison. In the midst of diction lessons and studio revamping, Don falls under the spell of a struggling singer/actress named Kathy Seldon (Debbie Reynolds). Expecting her to do the same, he gets quite an ego check in return and in time, a wiser and more human Lockwood adapts a more down-to-earth approach that brings the two closer together. Wonderful acting by all, particularly by Hagen (in an Oscar�-nominated performance) and the rarely praised Douglas Fowley as saddled film director Roscoe Dexter, whose attempts to coordinate Lina into the sound era provide some of the film's funniest moments. Image Transfer Review: As for the film's initial DVD incarnation, let's just say it's a lot smoother than the film industry's transition from silents to sound. Filmed at the height of Technicolor in 1952, Singin' in the Rain is a natural for the newest home video format. After seeing washed out prints on local TV and VHS for years, I can without question say this is the best Singin' has ever looked. There's some minor nicks here and there (atypical for films of this era), but color is beyond consistent and sometimes rivals transfers of modern day films. As evidence, check out the Broadway Melody sequence (Chapters 44 thru 49). Simply jaw dropping stuff for musical lovin' videophiles like me. Audio Transfer Review: As a bonus, virtually all of the score and musical high points have been given an incredible Dolby Digital remix in 5.1 audio (and it's not even mentioned in the initial packaging!). At the height of their powers, the sound engineers during MGM's golden years had the foresight to record most of their film soundtracks in primitive stereo, strategically placing microphones at various angles between performers and their orchestral accompaniment. Fortunately, many of these original session masters were preserved and with modern day tweaking, it sounds like Gene Kelly and company are right in your living room. Extras Review: If there's any problem with this excellent disc, it is the lack of extras. Granted, a 60-point chapter search and a vintage trailer are welcome features, but two musical numbers cut from the film are still in the vaults (Debbie Reynolds' You Are My Lucky Star and a Kelly rendition of All I Do is Dream of You) that have been showcased on other MGM home video releases; they would have been perfect supplementary material. 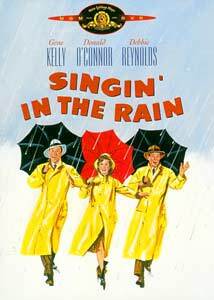 Given its digital debut in the initial days of the format, Singin' in the Rain is an amazing preservation of an American movie classic. Beyond recommended.